John has changed. He is more grown up. 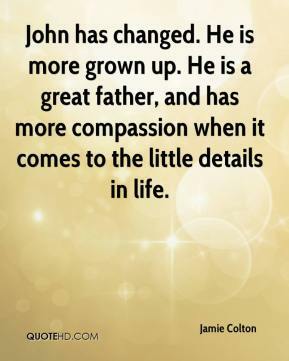 He is a great father, and has more compassion when it comes to the little details in life. 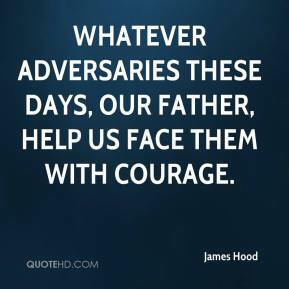 Whatever adversaries these days, our Father, help us face them with courage. 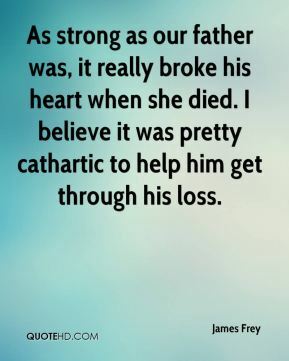 As strong as our father was, it really broke his heart when she died. I believe it was pretty cathartic to help him get through his loss. 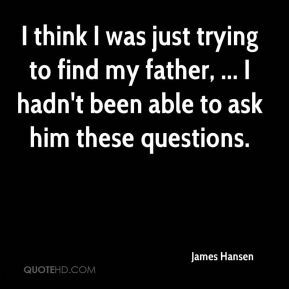 I think I was just trying to find my father, ... 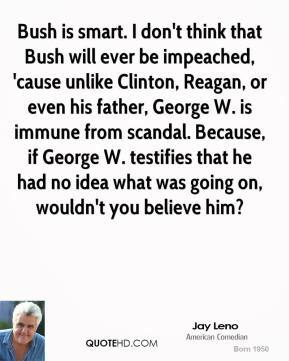 I hadn't been able to ask him these questions. When I was young I had all the advantages. 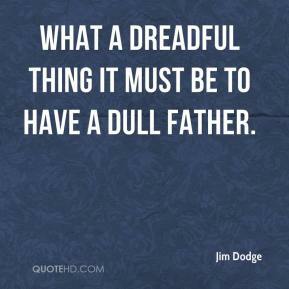 My father worked for Howard Hughes, we lived in Bel Air. I went to the best schools, and got the best girls. 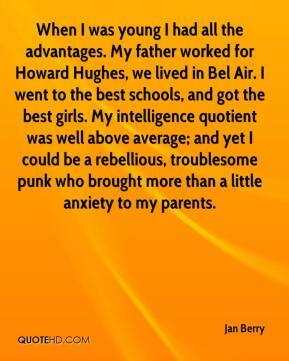 My intelligence quotient was well above average; and yet I could be a rebellious, troublesome punk who brought more than a little anxiety to my parents. My father passed away, and that was hard. 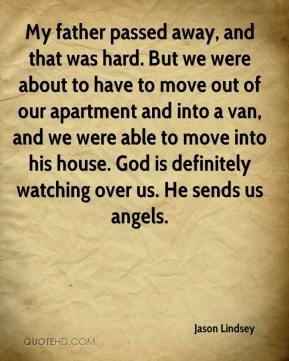 But we were about to have to move out of our apartment and into a van, and we were able to move into his house. God is definitely watching over us. He sends us angels. I remember when it happened she didn't know where her father or her aunts or her grandmother was and how her grandmother was really sick. I remember her talking about that a lot. 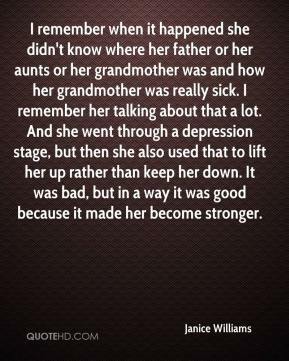 And she went through a depression stage, but then she also used that to lift her up rather than keep her down. It was bad, but in a way it was good because it made her become stronger. You just ignore it. You know you're qualified. 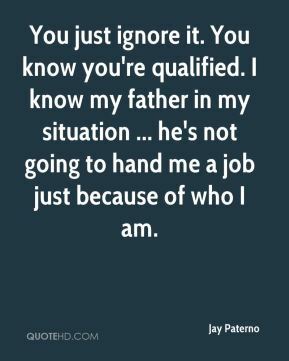 I know my father in my situation ... he's not going to hand me a job just because of who I am. 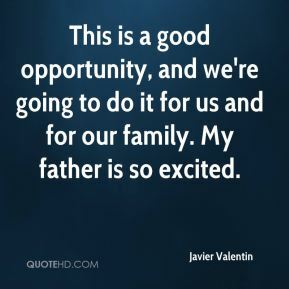 This is a good opportunity, and we're going to do it for us and for our family. My father is so excited. 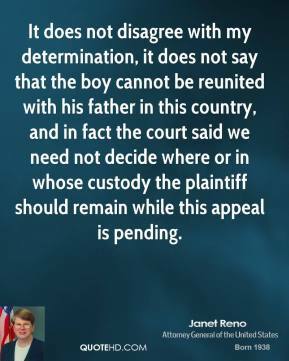 It does not disagree with my determination, it does not say that the boy cannot be reunited with his father in this country, and in fact the court said we need not decide where or in whose custody the plaintiff should remain while this appeal is pending. 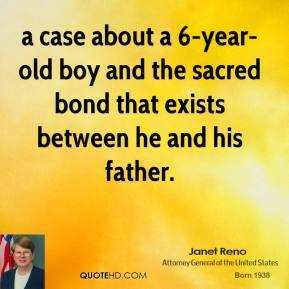 a case about a 6-year-old boy and the sacred bond that exists between he and his father. 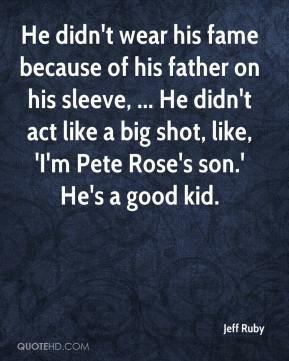 He didn't wear his fame because of his father on his sleeve, ... He didn't act like a big shot, like, 'I'm Pete Rose's son.' He's a good kid. 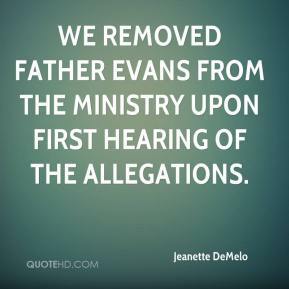 We removed Father Evans from the ministry upon first hearing of the allegations. He did not want the life his father had lived. 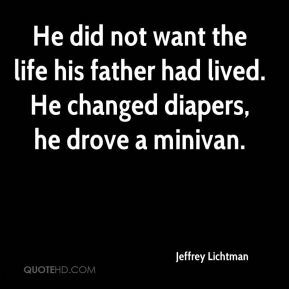 He changed diapers, he drove a minivan. I can identify with the character really well. 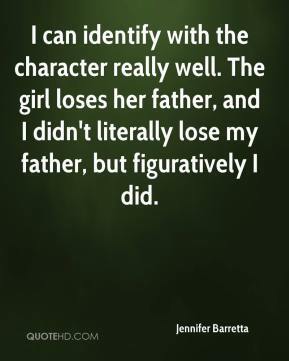 The girl loses her father, and I didn't literally lose my father, but figuratively I did. 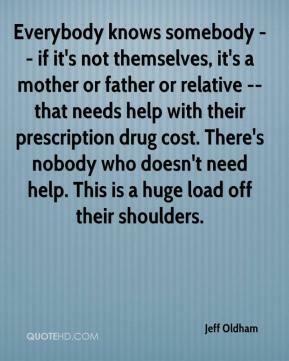 Everybody knows somebody -- if it's not themselves, it's a mother or father or relative -- that needs help with their prescription drug cost. There's nobody who doesn't need help. This is a huge load off their shoulders. 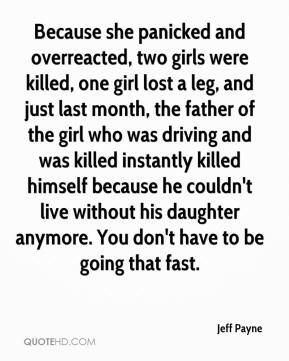 Because she panicked and overreacted, two girls were killed, one girl lost a leg, and just last month, the father of the girl who was driving and was killed instantly killed himself because he couldn't live without his daughter anymore. You don't have to be going that fast. 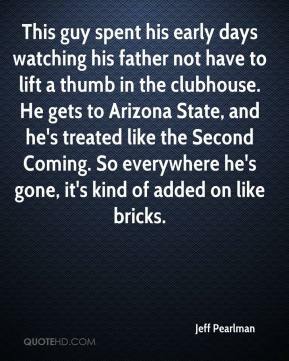 This guy spent his early days watching his father not have to lift a thumb in the clubhouse. He gets to Arizona State, and he's treated like the Second Coming. So everywhere he's gone, it's kind of added on like bricks. 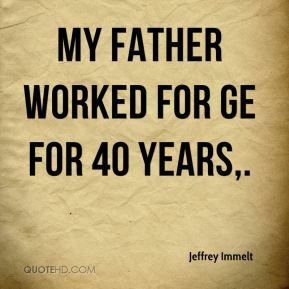 My father worked for GE for 40 years. 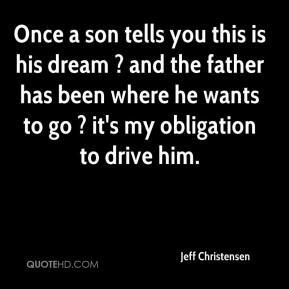 Sometimes a son will do anything just to be around his father, accepted by him. 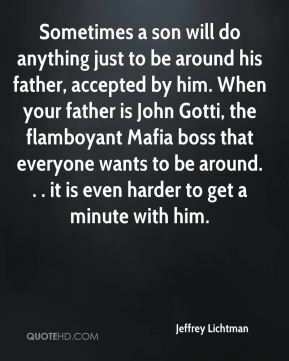 When your father is John Gotti, the flamboyant Mafia boss that everyone wants to be around. . . it is even harder to get a minute with him. 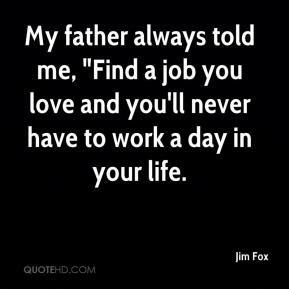 My father always told me, "Find a job you love and you'll never have to work a day in your life. My father was very proud of the fact he could put my brother through school. 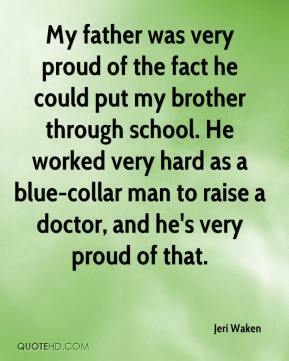 He worked very hard as a blue-collar man to raise a doctor, and he's very proud of that.